In or out? Treadmill or track? Shorts and a T-shirt, or your best assortment of winter layers? 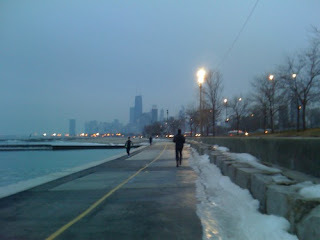 If you're going to run in the winter, where do you opt to get 'er done? This winter might be the exception to the rule--I know I'm breaking my running habit left and right, shocking myself every time in the process. I don't run in winter. I don't race in winter. I'm lucky if I even look at my running shoes in winter. If those three assertions aren't enough to spell out my disdain for winter running under normal circumstances, that is, when the wind is whipping off the lake and the temperatures feel even colder than they actually are and we're buried under snow (that's my definition of winter Chicago normal), then I'll say it again: I'm not a winter runner. But give me sunny days, hardly any snow, little ice, and temperatures that leave me sweating even when I try ever so hard to balance the layers properly and not overheat, and my running ritual--that no winter running thing--doesn't exist. I might not be knocking out mileage that would prepare me for a marathon, and I might be completely satisfied even if I'm only out for 30 minutes (in days past that wouldn't even count in my marathon-trained brain). But still, I'm running outside, I'm braving the elements and I'm finally putting all of my winter running gear that easily collect dust in the drawer to good use. What is wrong with me? This never--and I mean never--happens. I even scared my husband one Sunday when I lounged around for most of the day and then finally decided it was now or never to run. "Are you OK?" he asks. Meanwhile, I'm practically beaming at my accomplishment, especially when he decided to stay indoors and it was just me going to brave Mother Nature (she wasn't that bad aside from some ice coating the path, turning my run into part obstacle course). There's nothing wrong with me. I just finally realized that I can't tolerate the treadmill. Every time I end up on it--like those Fridays where we'd get snow to screw with my run--I'd be bored within five minutes, hoping, praying that I could stop the torture soon. No such luck when you have a 15-minute warm-up, 20 to 30 intervals, and then a cool down to conquer. Walking? No problem. But even the best Diners, Drive-Ins and Dives marathon, Extreme Home Makeover episode or movie I find on the TV can save me on a run. And my running playlist, which helps me tune into the music and tune out the distractions on the path, doesn't help one bit on the dreadmill. It may have taken a few years removed from the time my quads froze weathering the elements on Christmas Day to escape chaos at my cousin's house, but I'm team outside all the way*. *Just don't ask me when the winds are howling, the snow is blowing, and the temperatures are hovering near zero. I had to coach a workout in sub-zero, or close to it, temperatures, and that was the night that I wanted to be on team hot chocolate. Forget the running--I needed a fireplace, a blanket and a warm mug to wrap my fingers around more than anything else. I might be cursing the weather gods by saying this, but at least we only have a few more weeks of wacky weather to contend with. Hopefully. I keep reminding myself that it was near 80 at last year's Shamrock Shuffle and though the race might be two weeks earlier this year, the Windy City has been known to have stray hot days in March. Where do you prefer to run in the winter? Are you on Team Treadmill or Team Outside?